Please note: if you're using HubSpot Sales Outlook desktop add-in, check out this article instead. use a supported version of Outlook. Please note: Outlook installed from the Microsoft Store is not compatible with the HubSpot Sales Office 365 add-in. Check your Outlook version to ensure it is Click-to-run. have access to the Microsoft store. have the necessary permissions from your email administrators to use third party add-ins in your inbox. add the add-in in each inbox if you're using multiple inboxes. If you're using the Office 365 add-in in Outlook desktop on a PC, you might experience the add-in being grayed out/disabled. If the Office 365 add-in is grayed out in both your main Outlook inbox ribbon and within your Outlook message ribbon, there's an issue with your Outlook program itself. Try closing Outlook and reopening it. First, check to see if your email is being encrypted. You may need to contact your IT team for this. Search for and select Uninstall a program or Add or remove programs. Locate and click the Outlook or Microsoft Office program, then click Modify or Change. In the dialog box that appears, you’ll be asked to select the Repair mode. Select Online Repair, then click Repair. Your inbox hasn't been connected. The HubSpot Sales Office 365 add-in requires a connected inbox. If you're using an Outlook desktop account on a PC or Mac, click Sales Tools in the Outlook message ribbon. If the Sales Tools icon is grayed out, restart Outlook. 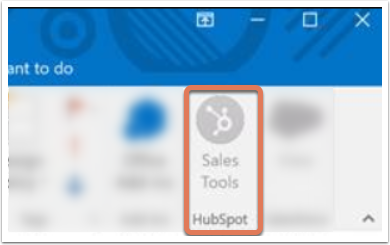 If you're using an Outlook on the web or Outlook.com account, compose a new email and click the HubSpot sprocket icon sprocket in the bottom right-hand corner of the email composition window. Emails sent in Plain Text mode cannot be tracked. If you see that emails are sent in Plain Text, switch to HTML mode in the email client you're using with Office 365. The Track email opens box was not selected when the email was sent. You'll need to check the box for each email you'd like to track.